My Aquarium (Hudson Entertainment, 1 player, Rated E for Everyone, 500 Wii Points): With swaying aquatic plants and fish idly swimming about, My Aquarium is a relaxing Wii experience that allows you to enjoy a virtual aquarium in your spare time. Whether freshwater or saltwater, you can select from over 40 popular types of fish, including favorites like the Ocellaris clownfish, the freshwater angelfish and the Asian arowana. You can also create up to six different aquariums and personalize them by adding decorations like seaweed and driftwood. In My Aquarium, you can send aquariums to your registered Wii Friends. The aquariums can even be set with special dates, such as a friend’s birthday, that the fish will commemorate with a dance. Feed your fish and watch them steadily grow from fry to adult. Then, after meeting certain conditions, you can breed them. Another feature will allow you to interact with your fish using your Wii Remote™ controller in fun ways, like “tapping” the glass of your aquarium. Imma name my baby Clu Clu. Has anyone downloaded the strongbad episodes? If yes, how are they? Second, I need more info on why said mario rpg (square title?) is so awesome. 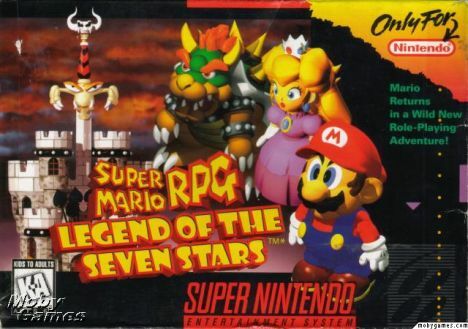 I think this game was out before I started playing RPG’s, maybe it came out after I played Chrono Trigger. I DON’T KNOW.